Depicted in today’s POTD is the prototype of a Trijicon RMR red dot sight guard that is being developed by Weapons Armament Research. This little device basically combines an RMR mounting plate and a front frame designed to protect the lens from damage. The company develops the RMR guard for Glock MOS and FN 509 […] Read More … The post POTD: Weapons Armament Research RMR Guard Prototype appeared first on The Firearm Blog. Aridus Industries makes some of the best accessories for shotguns. The QDC and CROM have proven to be the best setups to run on a Beretta 1301. My Magpul Edition 870 has all the Aridus goodies on it. The CROM was designed to allow an Aimpoint T1 or T2 to cowitness the iron sights on […] Read More … The post Aridus Industries RMR CROM Now Available appeared first on The Firearm Blog. 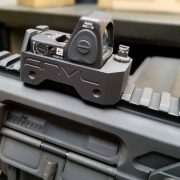 When we first wrote about the ANVL UKON for the Trijicon RMR with backup iron sights (BUIS), the comments section had its share of critics, many revolving around a short sight radius. But here’s the thing about judging a book solely by its cover: you may not get the full story. 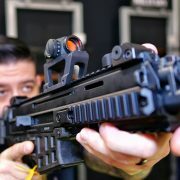 The good folks at […] Read More … The post [SHOT 2019] ANVL UKON 2 On The New CZ Bren 2 – ANR Design appeared first on The Firearm Blog. 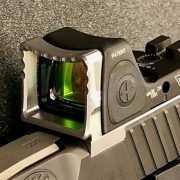 When we first wrote about the ANVL UKON for the Trijicon RMR with backup iron sights (BUIS), the comments section had its share of critics, many revolving around a short sight radius. But here’s the thing about judging a book solely by its cover: you may not get the full story. 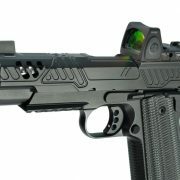 The good folks at […] Read More … The post [SHOT 2019] ANVL UKON 2 On The New CZ Bren 2 – ANR Designer appeared first on The Firearm Blog. Are you more of an Old School or Red dot Space Gun kind of person? Ed Brown do both, and have renewed their collaboration with ZEV Technologies for 2019. Below you can see their brand new creation THE ORION. As to be expected, this 1911 is hand-fit with fully machined parts. Ed Brown […] Read More … The post ZEV Technologies & Ed Brown together – The Orion appeared first on The Firearm Blog. Agency Arms is well known for their Glock modifications. They have just expanded their customization with their AOS. 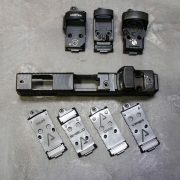 The Agency Optic System is a modular optic mounting system for attaching micro red dots onto Glocks. The AOS has interchangeable plates for use with the top four micro red dots. Trijicon RMR, Shield RMS, Leupold Delta […] Read More … The post Agency Arms A.O.S. – Agency Optic System appeared first on The Firearm Blog. 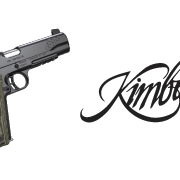 Kimber has taken one of their new models for 2018, the KHX series of 1911s, and upgraded it even further. Now you can get the KHX Custom (5″ barrel models) with a factory-installed Trijicon RMR. This upgrade obviously bumps the price for consumers, but it will immediately improve most anybody’s accuracy as well. The new […] Read More … The post NEW Kimber KHX Custom gets Topped Off with a Trijicon RMR appeared first on The Firearm Blog. Kydex holster and stealth makers ANR Design has come up with a new mount for the Trijicon RMR when on long guns. Branded the ANVL, the picatinny rail attachment incorporates both front and rear back up iron sights that cowitness in the lower third of the RMR. 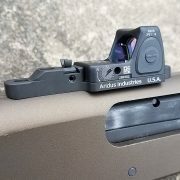 The mount is designed to be run forward […] Read More … The post Mount Up: ANR Design ANVL UKON RMR Base with BUIS appeared first on The Firearm Blog. 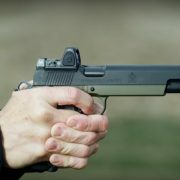 Springfield Armory just announced, roughly around midnight, a NEW 1911 TRP 10mm RMR! This pistol chambers the stout 10mm cartridge with the added benefit of a reflex optic such as the Trijicon RMR. The 10mm Auto cartridge has seen a significant resurgence in the past couple years. It was just this past November that Springfield […] Read More … The post BREAKING NEWS: Springfield Armory 1911 TRP 10mm RMR appeared first on The Firearm Blog.